PRICE GOOD TIL JANUARY 1,2017. "GONE WITH THE WIND" ORIGINAL ONE SHEET MOVIE POSTER- EXTREMELY RARE. But it is in glorious BLACK and WHITE. That same year THE WIZARD OF OZ was filmed with the same cameras. As was the "fashion show" in THE WOMEN. But nothing came close to the richness of the Technicolor of GONE WITH THE WIND. When the lights dimmed and still dim in any theatre, nothing else has ever pumped the blood of an audience or matched that breathtaking moment when those words GONE WITH THE WIND grandly and spectacularly scrolled from left to right. Not even in a small theatre on a tiny screen in Fayetteville/Manlius, New York in 1961. That brilliant Max Steiner music... This ORIGINAL GWTW ONE SHEET is now an exquisite 74 years old. The artwork is by ARMANDO SEGUSO and depicts "SCARLETT FLEEING FROM ATLANTA", one of several styles he designed for the December 1939 Atlanta World Premiere, and subsequent National first run openings. The "balloon" declaring to audiences that it was a LIMITED ENGAGEMENT FULL LENGTH NOTHING CUT BUT THE PRICE was added two months after the New York and Hollywood premieres to reassure audiences that this was the first-run of the ORIGINAL movie. Some balloons were glued on and some were printed on the poster. This is one of the printed on balloons. The poster measures 27 X 41 inches and was FOLDED. It is in EXCELLENT CONDITION with only some slighit fold wear/seperation. It is clean and retains it's vibrant rich colors and pastels. This is the GWTW collector's dream poster and one of the rarest and hardest to find. You wont find another ANYWHERE right now! GONE WITH THE WIND is still considered to be Hollywood's Masterpiece. It was the most eagerly anticipated and talked about motion picture ever made, in breathtaking technicolor, with non- CGI spectacle, created under the fierce watchful eye of Producer David "the son-in-law also rises" of Louis B. Mayer O'Selznick, with the greatest cast ever assembled, unparalled brilliant acting, and the most romantic love story ever put on screen. Have your teenage/college son or daughter sit down and watch it with you now, for a "movie" night. After the final "After all, tomorrow is another day" ask them when they think the movie was made. You will be shocked when they tell you that it is a new movie. Surprisingly, the original poster art also designed by Armando Seguso used for the premiere for the 1939 release of GWTW is pedestrian and bland. It is NOT the blazing Howard Terpning (Rhett carrying Scarlett in her red shimmy as Atlanta burns) 1967 reissue poster art that most everyone, including many uninformed collector's, believe is the original 1939 poster. Interesting sidenote: In 1987's brilliant but underrated EMPIRE OF THE SUN directed by STEVEN SPIELBERG, young Jamie, played by a then 12 year old Christian Bale, wanders alone thru the teeming streets of 1941 Shanghai and passes a movie theatre showing GONE WITH THE WIND. There is a huge billboard over the marquee showing GONE WITH THE WIND. But still a huge technical error especially to someone with Scarlett fever. He should have used this "Scarlett fleeing Atlanta " poster art by artist ARMANDO SEGUSO which would have brilliantly reflected Jamie trying to escape Shanghai... However this GWTW poster is considered the finest and most beautiful from all the original designs, (including it's many reissues) until the wonderful Terpning poster in 1967. It is the rarest of opportunities to add this crown jewel GONE WITH THE WIND original poster to your collection. You will not find one available in any condition, let alone this quality. I personally waited 26 years for this poster. Herb Bridges is considered the preeminent expert authority and had the most massive collection in the world of all things GONE WITH THE WIND. He has written seven books on the movie, and has internationally lectured on it. POSTER PROVENANCE: CHRISTIE'S NEW YORK. THE HERB BRIDGES GONE WITH THE WIND COLLECTION WEDNESDAY 24 JULY 2002. I'M TIRED OF DEATH AND BLOOD. I'M GOING HOME--I WANT MY MOTHER. I started collecting NEW and VINTAGE ORIGINAL MOVIE POSTERS especially GONE WITH THE WIND, STAR WARS. All SPIELBERG, DISNEY, ACADEMY AWARD WINNERS, BATMAN, LORD OF THE RINGS, HARRY POTTER. Since I was a 27 year old in 1976 when I moved and lived in NYC. Needless to say, it is a diverse and eclectic collection of over 650 POSTERS. I also collected ANIMATION ART, specifically ORIGINAL DISNEY HAND PAINTED PRODUCTION BACKGROUND PAINTINGS that went under camera in the filming of Disney movies. All the photographs you see of my posters and art are ones that I have taken, not downloaded from other online sites. Whether you're a fan, collector, dealer, and/or looking for an investment piece this is a great opportunity. The Movie Poster and Animation Art I offer will be interesting, diverse, original and in many cases a rare opportunity for any collector. Yes, some are Museum quality pieces, or obviously will be. 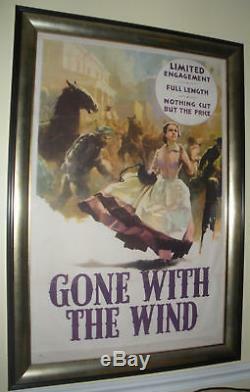 This GONE WITH THE WIND poster is one of them. And wait till you see what will be COMING SOON TO A THEATRE NEAR YOU!!! Too often in life we regret not doing things that we are able to do, for whatever reason, when we are presented with the opportunity to do so. I say Never live with regret. To protect both parties I will insure all items for the full amount. We are aware that accidents can happen. Our items will be insured thru the US Postal Service. The item "GONE WITH THE WIND ORIGINAL 1939 MOVIE POSTER- MAGNIFICENT ART" is in sale since Monday, February 14, 2011. This item is in the category "Entertainment Memorabilia\Movie Memorabilia\Posters\Originals-International\1940-49". The seller is "tmqposters" and is located in Maryland.